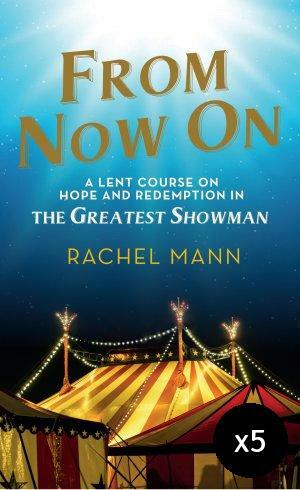 A brilliant new Lent Course for 2019, based on the hugely popular film The Greatest Showman. The 2018 Golden Globe-nominated movie starring Hugh Jackman, about the founder and stars of the Barnum & Bailey Circus is ideal for Lenten study of Christian themes of hope, redemption and new life. The five-week course offers discussion points, biblical reflections and prayers based on short excerpts from the film. The themes are: (1) 'A Million Dreams', exploring what liberation and hope might look like for an 'outsider' in the world; (2) 'Come Alive', exploring how the family of faith can bring hope and purpose; (3) 'Rewrite the stars', asks what forms of resistance can be placed in the way of salvation; (4) 'Never Enough', questions the temptations of false fulfilment that can lead us to betrayal; (5) 'The Greatest Show', shows how redemption is found when we discover 'the circus is our home'. From Now On - DLT Lent Book for 2019 - Pack of 5 by Rachel Mann was published by Eden bundles in January 2019 and is our 4269th best seller. The ISBN for From Now On - DLT Lent Book for 2019 - Pack of 5 is EDENBUNDLE-2275. Be the first to review From Now On - DLT Lent Book for 2019 - Pack of 5! Got a question? No problem! Just click here to ask us about From Now On - DLT Lent Book for 2019 - Pack of 5.